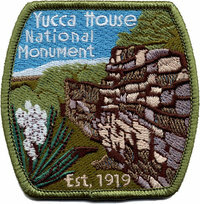 Embroidered, sew-on patch featuring the towers of Cliff Palace and artwork commisioned for the 2006 Mesa Verde National Park Centennial. 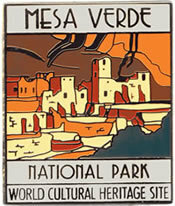 Text reads "Mesa Verde National Park Est. June 29, 1906". 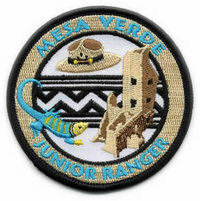 Embroidered, sew-on patch featuring the custom Mesa Verde Junior Range logo. An excellent addition to the collection of any Junior Ranger. Embroidered, sew-on patch features Mesa Verde's classic "Towers of Cliff Palace" logo and World Cultural Heritage Site designation. The black and white background was inspired by ancient puebloan pottery design elements. 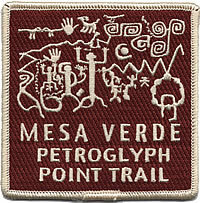 Embroidered, sew-on patch featuring elements from the large and intricate petroglyph panel at Mesa Verde National Park. The Petroglyph Point Trail offers stunning views of Mesa Verde and is the only place in the park to see petroglyphs. Colorful, enamel pin which prominently features the iconic towers and kivas of Cliff Palace. 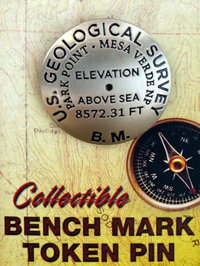 Text includes the Mesa Verde National Park designation as a World Cultural Heritage Site. 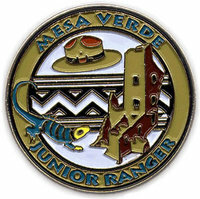 Enamel pin featuring the custom Mesa Verde Junior Range logo. An excellent addition to the collection of any Junior Ranger. 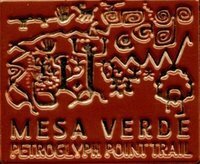 This lapel pin features Mesa Verde's classic "Towers of Cliff Palace" logo and World Cultural Heritage Site designation. The black and white background was inspired by ancient puebloan pottery design elements. 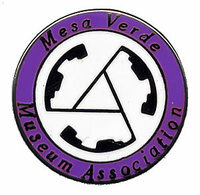 This lapel pin features the iconic Mesa Verde Museum Association logo which was adopted from an Ancestral Puebloan Black-on-White bowl currently on display in the Mesa Verde Visitor's Center. Available with white or purple border, please indicate in the comments which you would prefer.